Chinese handset maker Xiaomi surpassed global smartphone giants Samsung and Apple in terms of market share to become India's top 4G handset seller in January this year, CyberMedia Research said on March 17. Earlier this month, the market research firm had said that the iPhone maker emerged as the largest 4G LTE device vendor in the country in October-December 2014. As per the latest CyberMedia Research (CMR) data, Xiaomi leads the 4G LTE device market with 30.8% market share in January followed by Apple (23.8%), Samsung (12.1%), HTC (10%) and Micromax (8.3%). In October-December 2014 quarter, over one million 4G devices, including smartphones, tablets and data cards were shipped to the Indian market. Apple led with a 45% market share at the end of October-December quarter in 2014, followed by HTC at 19% and Samsung at 16%, it had said. 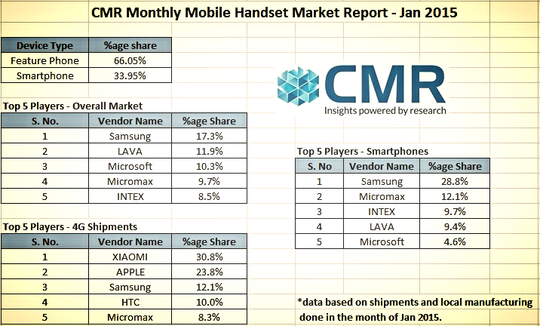 Overall in handsets in January 2015, including feature phones, smartphones, 3G and 4G mobile phones, Samsung led the pack with 17.3% market share followed by Lava (11.9%), Microsoft (10.3%), Micromax (9.7%) and Intex (8.5%), CMR said. Samsung was also the top smartphone vendor in India with 28.8% market share in January followed by Micromax (12.1%), Intex (9.7%), Lava (9.4%) and Microsoft (4.5%), it added. Overall, feature phones accounted for 66.05% of the handsets shipped in January 2015, followed by smartphones at 33.95%, CMR said.